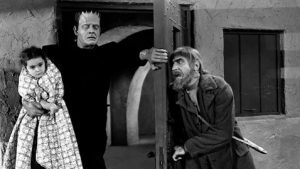 Ghost of Frankenstein begins with the residents of village Frankenstein, feeling that they’re under a curse, and blaming it on the maker of Frankenstein’s monster and on Ygor, who’s still alive after having been shot by Wolf Frankenstein (Basil Rathbone) at the end of Son of Frankenstein. Running away from the torches and pitchforks, Ygor finds the monster (Lon Chaney Jr.) released from his sulfuric tomb in the castle’s catacombs by the explosions. Unseen by the villagers, Ygor and the monster flee the castle to the surrounding countryside; during a thunderstorm, the monster is struck by a bolt of lightning, rejuvenating him. Ygor decides to find Ludwig, the second son of the original Frankenstein, to help the monster. Ludwig Frankenstein (Cedric Hardwicke) is a famous brain surgeon, who has just completed a revolutionary surgery removing the living brain from a human cranium, operating on it and returning it. He’s performed this with the aid of his two assistants Dr. Kettering (Barton Yarborough), and his former mentor, Dr. Bohmer (Lionel Atwill). Bohmer was a brilliant surgeon, whose career was ruined in one careless moment. He now works for his former student, letting his resentment grow over time. When Ygor comes into town looking for Ludwig, the child-like monster sees some children playing. When a young girl named Cloestine Hussman (Janet Ann Gallow) loses her ball, he lifts her up to the rooftop to retrieve it. Unwittingly this leads to the death of two villagers. After Cloestine asks the monster to take her to daddy, the monster does so. The creature is immediately captured by the entire police force. 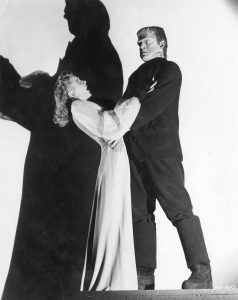 The town prosecutor, Erik Ernst (Ralph Bellamy), comes to Ludwig Frankenstein and asks him to examine the giant they have captured. Frankenstein says he will do so shortly. Soon, Ygor pays Ludwig a visit informing him that the giant at the police station is his father’s monstrous creation. Ygor implores the Doctor to heal the monsters sick body and brain. Ludwig refuses, not wanting the monster to ruin his life as it did his fathers and brothers. Ygor blackmails Ludwig by threatening to reveal Ludwig’s ancestry to the villagers and Ludwig agrees. At the police station, the monster is restrained with chains as a hearing is conducted to investigate the murder of the two villagers. The mute monster does not respond until Ludwig Frankenstein arrives and the monster shows signs of recognizing him. When Ludwig Frankenstein denies knowing him, the monster goes berserk and breaks free, and Ygor leads the monster away. While alone in her father’s study, Elsa (Evelyn Ankers), Ludwig’s daughter and love interest to prosecutor Ernst finds the Frankenstein journals and reads them, learning the story of the monster, showing the audience scenes from the previous films in flashback. She then sees the monster and Ygor in the window and screams reminding us of her title of scream queen. Next, Ygor and the monster break into Frankenstein’s laboratory and the monster kills Dr. Kettering. The monster grabs Elsa, but Ludwig is able to subdue it with knockout gas. When Elsa revives, Ludwig tells her of Kettering’s death and promises her that he will not let the Frankenstein curse come between them. Ludwig is inspecting the monster when it revives and tries to kill him; after sedating it again, Ludwig tries to get Bohmer’s assistance in destroying it once and for all by vivisection. Bohmer refuses since it would be murder. Ludwig sees a vision of his father whether a ghost or a product of Ludwig’s mind isn’t clear. The ghost implores Ludwig to not destroy his creation, but instead to perfect it with a good brain instead of the damaged murderer’s brain its had since the original Frankenstein film. Ygor: No not that. Doctor, Ygors body is no good. His neck is broken, crippled, and distorted. Lame and sick from the bullets your brother fired into me. You can put my brain in his body. Dr. Ludwig Frankenstein: Your brain? Ygor is indeed a cunning fellow and promises Bohmer the moon if Bohmer will betray the doctor, and make sure that its Ygor’s brain that’s transplanted into the monster’s body and Bohmer considers it. There’s a reason that Ygor is compared to Iago, and this scene is an excellent example. Dr. Ludwig Frankenstein: [the Monster taps the childs forehead, then his own] He wants the brain of that child! When Ygor protests, the monster violently pushes him aside, damaging the hunchbacks spine. Elsa intervenes, as the young girl doesn’t want to donate her brain, naturally, enough. The monster reluctantly gives the girl to Elsa. Soon, Ludwig performs the surgery, with the aid of Bohmer, believing that he is transplanting Kettering’s brilliant, benevolent brain into the body of the monster. In the village, Cloestine’s father rouses his neighbors by telling them that his daughter has been captured by the Monster and that Ludwig Frankenstein is harboring the monster. The mob of villagers race to the chateau. But Prosecutor Ernst convinces them to give him five minutes to convince Ludwig Frankenstein to give up the monster. Ludwig admits to his future son-in-law that he has the monster and agrees to show him to Erik thinking that Kettering’s brain is in his skull. In a truly chilling moment, however, after the operation, the monster speaks with the voice of Ygor: “I am Ygor”. From this point on, it is Lugosi who is made up as the monster as least for facial close-up shots. The villagers now storm the chateau and the Monster (with Ygor’s vicious, vindictive brain) decides to have Bohmer fill the house with gas to kill them. Ludwig tries to stop him, but the Monster repels the attack and mortally wounds Ludwig. The villagers find Cloestine and run from the building, fleeing the deadly gas. The Frankenstein monster cries out, Bohmer! You tricked me, Bohmer! The dying Ludwig explains, “Your dream of power is over Bohmer. You didn’t realize his blood is the same type as Kettering’s but not the same as Ygor’s. It will not feed the sensory nerves.” The monster is now blind explaining the arm-out-front groping walk that the Monster has in his future films. The Monster accuses Bohmer of tricking him and asks “What good is there a brain without eyes to see?” The Monster then throws Bohmer onto the apparatus electrocuting him and inadvertently sets fire to the mansion. This brings about his own demise until the next film, Frankenstein Meets the Wolf Man, at least as he is unable to get out of the chateau while Erik and Elsa walk off toward the sunrise together. Ygor (Bela Lugosi, Dracula, Island of Lost Souls). The hunchback who manipulates everyone else, especially Bohmer. 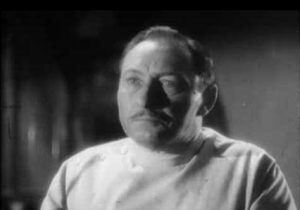 Dr. Bohmer (Lionel Atwill, Son of Frankenstein). Ludwig’s former teacher, whose bitterness has grown with time, which makes him all the more susceptible to Ygor’s manipulations. Dr. Kettering (Barton Yarborough). Ludwig’s other assistant, a likable, good man. A man accidentally murdered by the creature. Frankenstein’s monster (Lon Chaney Jr., The Wolf Man, Son of Dracula). Victor’s original creation, who thinks of Ygor as his friend, and befriends young Cloestine. Cloestine Hussman (Janet Ann Gallow). The monster’s young friend. Elsa Frankenstein (Evelyn Ankers, The Wolf Man, The Mad Ghoul). Ludwig’s daughter who learns the family history, and serves as love interest to the prosecutor. Erik Ernst (Ralph Bellamy). The prosecutor who puts Frankenstein’s monster on trial, is engaged to Elsa, and suspects Ludwig. The monster lives! Again! Picking up where Son of Frankenstein left off, Bela Lugosis gnarled Ygor survives yet another rampage by angry, torch-carrying villagers and frees the monster (The Wolf Man himself, Lon Chaney Jr., taking over from Boris Karloff) from his sulfur grave. The latest cinematic Frankenstein scion, brain surgeon Ludwig (Cedric Hardwicke), wants to dissect the creature, but the ghost of his father convinces him to save it by giving it a new, good brain. 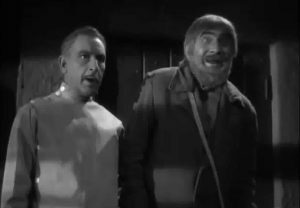 Ygor has his own devious plan and enlists Ludwigs shady assistant (Lionel Atwill) in a brain-switching scheme.